Microsoft today announced that going forward, it will not turn on the “Do Not Track” feature in the upcoming versions of Internet Explorer and Spartan by default. The “Do Not Track” setting in many popular browsers tells websites and their advertisers that you want to opt out of third-party tracking for advertising purposes. All of the major browser vendors, including Google, Mozilla, Opera, Apple and Microsoft, support this feature, but whether advertisers honor the user’s request — and it’s no more than a request sent by the browser — is up to them. And most probably don’t. 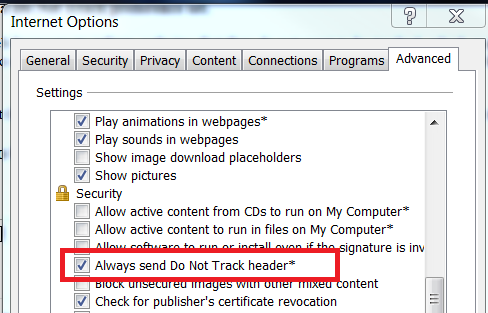 Microsoft started enabling “Do Not Track” as the default setting with the launch of Internet Explorer 10. Unsurprisingly, this created a bit of a controversy. Previous to Microsoft’s decision, advertisers had agreed to honor Do Not Track, as long as it wasn’t the default setting. They argued that the decision not to be tracked should be made by the user and not the browser vendor. Microsoft stuck to its guns saying users could always opt out during the setup process, and “Do Not Track” remained the default — until now (and the number of advertisers that honored it remained low). Chrome and Firefox leave “Do Not Track” off by default. Given the voluntary nature of “Do Not Track,” it probably doesn’t matter all that much whether you turn it on or off anyway. If you want to make sure you aren’t tracked, using tools like Disconnect and add-ons like Ghostery, uBlock and the EFF’s Privacy Badger is more effective anyway — at least on the desktop.